Unfortunately, I write this review with a heavy heart as only last night it was announced that Lysistrata Jones would end its Broadway run after less than a month after its opening. That’s really a shame because I felt that the musical was one of the most original offerings so far this season, despite its source material—Aristophanes’ Lysistrata—being thousands of years old. Also, it’s one of the few shows on Broadway that I would’ve gladly seen again. While the score and lyrics can be a bit trite, the choreography by Dan Knechtges—who also directed—features some of the most original moves to grace Broadway in many seasons. 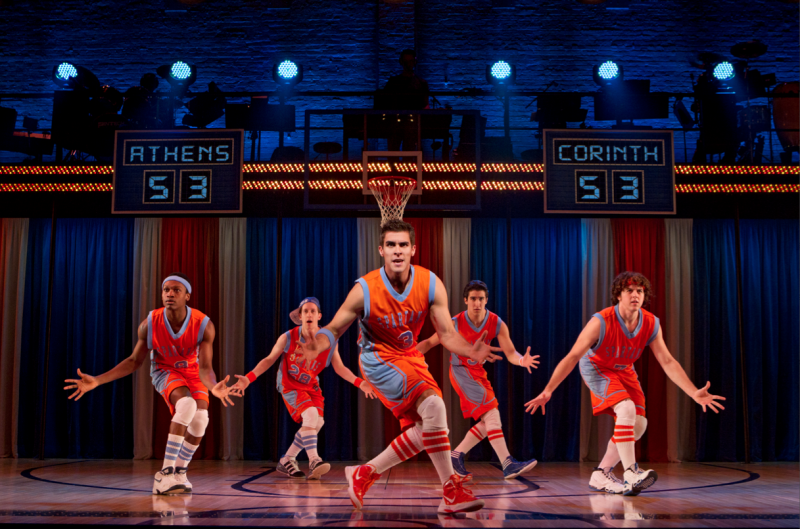 Also, I have no fear in saying that Lysistrata Jones features the best choreography with basketballs that has ever graced the theatrical stage. There, I said it. The moves are lively and athletic, and the young, agile cast is certainly skillful and game enough (no pun intended) to pull the moves off nicely. Starring in the title role, Patti Murin’s performance was nothing short of a star turn. She has that beautiful blonde leading lady look that has made a comeback in some of the pop musicals of the past decade (see: Legally Blonde, Xanadu, et al.). Lysistrata, as played by Murin, is a powerhouse heroine that girls can identify with, yet boys could conceivably go for without fear of a painful rebuffing. She’s a modern day Greek goddess with pom poms. 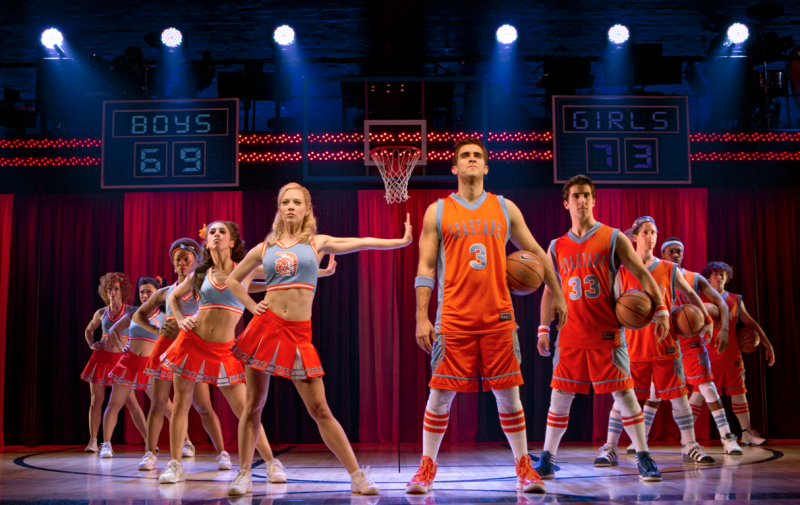 As her boyfriend and captain of the losing basketball team, Mick, Josh Segarra has that uber-handsome leading man quality that makes him at once a forceful onstage presence as well as somewhat forgettable once the curtain comes down. It’s not due to his lack of talent by any means—he can sing and move with the best of them. It’s almost because he’s a little bit, well, too handsome. If Ben Stiller and Zac Effron had a baby, it would closely resemble Segarra (yeah, I don’t know who would carry it either). I mean that as a compliment… I think. Every contemporary show seems to need that sassy black diva and Lysistrata Jones is no different and that diva is the character Hetaira played with a fun-filled ferocity by Liz Mikel. Brassy, sassy, and a pure force of nature, Mikel brings down the house with every single scene she’s in and is clearly an audience favorite. Acting as both narrator and a madame with a heart of gold, Mikel’s siren has some of the best numbers in the show…as well as one of the best costume reveals! One of the real treats of the show was Jason Tam as Xander, a left-wing anti-social blogger who gets drafted by Lysistrata to be the team’s mascot and, of course, finds true love along the way. Anybody who saw Tam as Paul in the 2006 A Chorus Line revival will be stunned by the young actor’s range. If you missed A Chorus Line, get thee to Netflix and put "Every Little Step" in your queue. The film details bringing the revival to Broadway and if Tam’s audition does not bring you to tears then you absolutely have no soul! It’s refreshing to see Tam jump and dance with, well, glee after his well-received yet painful portrayal of Paul. Also, with his bouncy pompadour, Tam has the best head of hair on Broadway since the Rum Tum Tugger prowled the boards. The rest of the cast shines in roles that are fairly standard issue—the Hispanic couple, the bookworm who becomes a sexpot, the dumb jock, etc.—however, the actors in those roles are anything but standard issue. They are actually believable as students at a less-than-stellar university who pass the time with sports, books, or local prostitutes. Lysistrata Jones is one of the few new musicals this Broadway season that does not disappoint and is simply a fun time in the theatre with an immensely likable cast, hummable silly tunes, original energetic choreography, and a few star turns that will make you wish that this sweet show had stuck around a little longer. Featuring: Patti Murin (Lysistrata Jones), Alexander Aguilar, Ato Blankson-Wood, Katie Boren, Lindsay Nicole Chambers, Liz Mikel, Kat Nejat, Josh Segarra, LaQuet Sharnell, Jason Tam, Teddy Toye, and Alex Wyse.